It's no secret that I love candied popcorn. It is simple, delicious, and inexpensive to make. Recently I changed up my Cinnamon Vanilla Popcorn Recipe a bit, and added some sliced almonds and shredded coconut. It was delicious. I also replaced a bit of the white sugar with brown sugar. My almonds and coconut were straight from the package, but you could toast them in the oven to heighten the flavor even more. 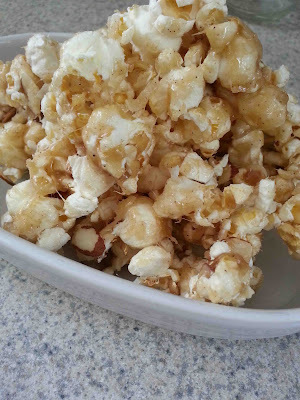 I recommend adding the almonds and coconut to the popped popcorn prior to covering with the candy. Is there a way I can pin this?